Here is a compilation with books on football (soccer), including the history of the game, the cultural aspects, the tactics, the stats, biographies of players, fiction and other subjects. Definitely one of the football books to read if you are interested about the history of the game (soccer). With almost 1,000 pages, it posses an extensive journey through the subject. A straight forward attempt to tell the history of football beginning in pre-industrial times and the growth to the 1994 World Cup in less than 300 pages. A well-received book about football and especially about the invention Total Football, but also an interested look at the history of the game in the Netherlands from a cultural perspective. 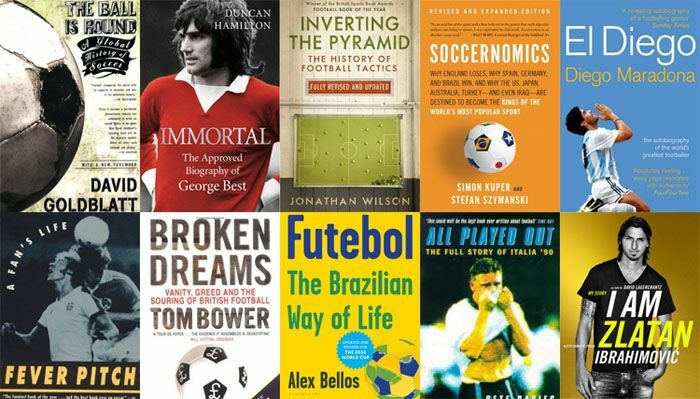 A book that distinguishes itself from many other books on football and somebody without a big interest of sport should also be able to read it. We all know how closed football and Brazil are connected and reading Futebol: The Brazilian Way of Life enriches that truism to a deeper and more nuanced knowledge. An earlier work and analogues in choice of topic is Soccer Madness by Janet Lever from 1995. Morbo was awarded the GQ Sports Book of the Year and is recommended if you want to read a book about the Spanish football history. The author Phil Ball is specialized on Spanish football and has also written an appreciated book on Real Madrids history. The winner of William Hill Sports Book of the Year in 2003 tells the story of football as a business that exploiting the sport for the lucrative reasons. Tom Bower investigates the cash flow in football and what he finds out is always very pleasant. Portraying football in England as a cultural phenomenon and a huge entertainment industry. This is one of the most impressive books written about football (soccer) in aspects of research. The writer, Jonathan Wilson, must have been watching videos of old football games for endless of hours to present so many details of historical matches. His book takes a full approach on the tactic aspects of the game and the theory behind the development: from extreme attack to extreme forms of defense since football emerge until today. It discusses several formations used over the years: who was the inventor and what are their pros and cons. You probably knew about Total Football and perhaps Catenaccio, but maybe you haven't heard about W-system or W-defense – this book teaches terms and historical facts to making you a football wiz. Another example of the nerds' conqueror the world era and if you want to fill your stock of football stats here is the source. Find out about long to short pass ratio, goals scored as a function of possession, goals conceded as a function of turnovers and much more. It may sound nerdish, but the authors are writing entertaining about football as well. This is the book to read if you want to win discussions about football. If you want theoretical insights and if you want to view the game from a non-conventional way this book by Simon Kuper (also the awarded author of Football Against the Enemy and The Football Men) and Stefan Szymanski is for you. In some aspects linked to Anderson and Sally in The Numbers Games, the authors of Soccernomics are investigating football from new angles and come up with some surprising and astonishing results. The last part of the subtitle “Why the U.S., Japan, Australia-and Even Iraq-Are Destined to Become the Kings of the World’s Most Popular Sport” is, however a selling tactic and this statement is only covered by a short and speculative chapter. Looking at football as a science Ken Bray explains and analyzes the tactics behind the game. The book includes a historical overview of tactics and many other areas, such as statistic knowledge of today’s modern matches. Although it’s not written by Zlatan himself (David Lagercrantz is the actual writer) it’s based on Zlatan’s own story about his life. I Am Zlatan has become an international bestseller. The most gifted player of all time? The story of Diego Armando Maradona is about success, but also the controversial episodes on (the hand of God) and outside the pitch (the cocaine, ephedrine and shootings against journalists). This is Diego’s own words. Duncan Hamilton work is not the only biography on the Wales legend, but perhaps the best. Few players lived as a fabulous life beside the pitch as George Best and no wonder that biography’s about him are sought after. Brian Clough was a unique manager and his life is also interesting enough to be both object for a book and a motion picture (The Damned United). Less known in comparison to John Barnes, Howard Gayle was nevertheless the first black player in Liverpool's first team. His story is about childhood, racism and football. Probably no other book about football has been more widely mention in popular culture than this one. A motion picture based on the book became a hit a few years later. A quite self-explanatory title says a lot of that this one is about. A chance to deepen your knowledge of the biggest clubs. A noticed book about the story of England in the World Cup in 1990. The story about the big takeover of Manchester City by Sheikh Mansour and questions about the role of money in today’s game of top football. This book conveys the difficulties of being the manager of the English national team looking back at the accomplishment on different managers. A touching story written by the son of the football player Gary Imlach. Unfortunately, match fixing is an actual problem with today’s sport and as the subtitle of the book suggests, soccer and organized crime are sometimes linked. As an investigating journalist Decland Hill infiltrates and acquire insights to the world of organized match fixing.